All awards are issued at the pleasure of the Commander-in-Chief, United Federation Starfleet. Recommendations are made in MSR's monthly by the respective Branch Heads and Station/Ship Commanders, who submit them to the Promotion and Awards Board for consideration. While other members of the Promo/Awards Board have a say, it is ultimately up to the Commander-in-Chief to give awards. Awards are then announced, along with the Promotions. As for annual awards, this is done in a similar setting as the Branch awards. All members of the Promotions Board make their recommendations and submit them to the Commander-in-Chief, who then makes his decisions from there. Awards are then compiled by the Awards director and prepared for release at the Admiral's Banquet. The only exception to the above mentioned case is the dispensation of Awards to the Commander-in-Chief. In this instance the Admiral has no say, and decisions on which awards are earned or deserved are made entirely by those on the Board. This is done in confidence and the Admiral's awards are announced by the Director of Promotions and Awards at the annual Admiral's Banquet. When displaying your awards on your uniform, there are several things one must pay attention to. Firstly and most importantly it is crucial to realize that some awards are more important than others. This means that while ordering your awards on either your uniform or on a Ribbon Display Rack, one must pay specific attention the order in which you arrange the ribbons. When arranging your awards, you should always begin with your lowest precedent ribbon (Look below for the order of Award's precedence), placing it on the lower right hand corner of your rack, continue by selecting the next ribbon and placing that to the right of your first ribbon. Continue this until you have four ribbons in one row, once this occurs, move up to the next row, again starting in the right corner and arranging them in order from lowest to highest. Continue until you have placed all your awards in, always putting rows in multiples of 4. If on the top row you have less than 4, be sure to space the awards evenly across the top. If you have multiples of any award, for example 2 Good Conduct awards, use the rules of clustering, adding the device on top of one of the awards. In addition, if you ever have a service award and for example you get another service award, (i.e. going from 1 Year Service Award to 2 Year Service Award) you only need to display the most recent award. I hope this explains better the concept of arranging your awards. Remember putting your awards in a rack is completely optional. Now I will explain the order of precedence for awards. As a general rule, Annual Awards hold a higher precedence than Branch Awards which hold a higher precedence than Service Awards. Within Annual awards, Lower Honors < Medium Honors < Top Honors < Special Honors. In Branch Awards, all Branches hold equal footing, however when arranging your Awards, it is usually common for you to place the awards given to you from your branch as higher than awards from other branches. The only exception to this rule is that Command Awards are given a higher precedence than any other Branch. Within each Branch, there should be at least one annual award, this holds higher precedence than the monthly awards. Within Branch Awards, other branches awards < your branches awards < Command Branch. Finally service awards, this is generally if you have one the first slot in your award rack, simple as that as you will only ever have one of these displayed at a time. I hope this better explains the process of Awards and their order of precedence. Ask the Director of Promotions and Awards if you have any questions. Keep up the good work, and keep on Trekking. When a decoration is awarded more than once to a particular crewmember, a second medal is not awarded, instead a cluster is earned. Clusters are small devices of either bronze, silver, or gold. Each bronze cluster represents a duplicate award, with bronze clusters being the only ones that take the actual award into consideration during the counting process.. In other words, the first time one received an award, it would be plain without any clustering devices on top. On a duplicate award of the same decoration, one would get a single bronze cluster. On yet another award of that decoration, another bronze cluster would be awarded. So someone possessing a decoration with two bronze clusters would actually have been awarded that particular award 3 times. At five awards, the award itself ceases to be counted and instead earns a silver cluster. Thus any decoration with a silver cluster denotes five awards, not six. 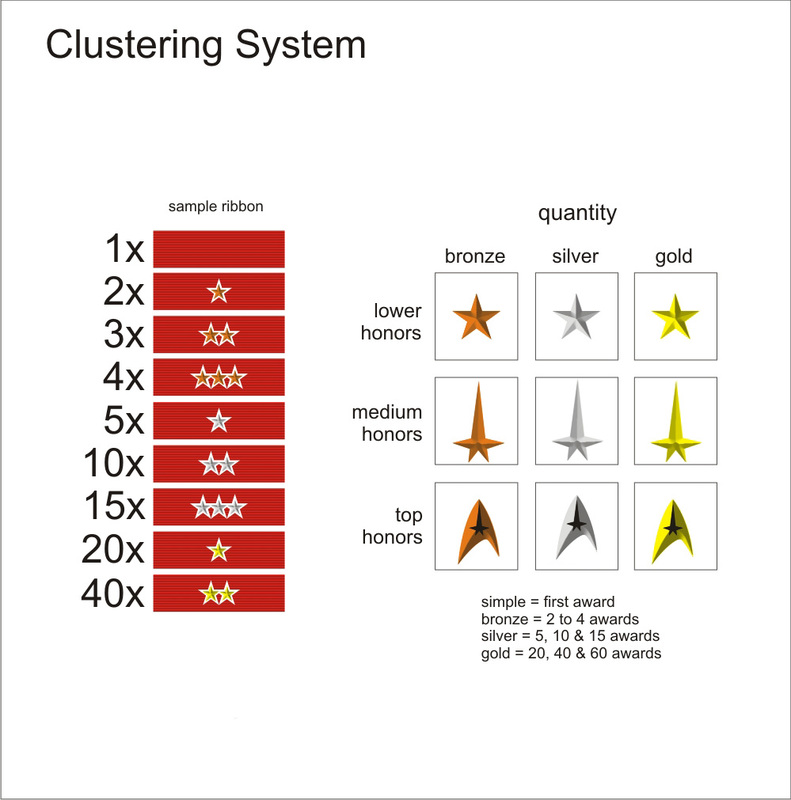 On the rare chance that a sixth decoration would be awarded, that crewmember would receive a bronze cluster but it is considered bad form to mix cluster types. Most would wait until their tenth such award and then wear a second silver cluster. It should be noted that certain decorations such as citations and major and minor commendations may be awarded many, many times during a career. In that event, a gold cluster can be worn to represent twenty awards. Once a crewmember earns a gold cluster, they will typically refrain from further clustering until twenty more decorations have been earned, taking then another gold cluster. Listed below are the UFS active awards divided by Honors Level as well as Branches they are designed for. Please note the Period the award is entitled to by clicking on the awards name and checking the detailed information. Order of Andoria - Awarded to individuals who organized or participated in successful Charity events in name of UFS. Order of Babel - Awarded to individuals who organized successful UFS official-related events. Order of Bajor - Awarded to members who have show creativity and originality in service of UFS, be it in creation of programs for UFS, creative solutions to problems, or create something unique for UFS. Order of Betazed - Awarded to a member for a significant act of friendship or outreach shown to a fellow UF Starfleet member, or for outreach to their community on behalf of UF Starfleet, their chapters or sectors. Order of Boreth - Awarded for members who take part in or help drive nature/ecological preservation programs or help spread their awareness. Order of Bynaus	- Awarded to members who create/design outstanding digital designs for UFS that are both unique and original. Order of Cait - Awarded to a member for activities in the area of creative writing, or writing for chapter, sector, or UF Starfleet publications. Order of Capella IV - Awarded to members who participate or take part in the development of Youth Programs or spread awareness of them. Order of Cardassia Prime - Awarded to members who help keep excellent records throughout UFS, be it fictional history, corporate history, program history, etc. This is for the quality of the records, details, and readability. Order of Cestus III - Awarded to members who participate or work to organize Disaster Relief Initiatives. Can also be awarded for spreading awareness of relief programs. Order of Denobula - Awarded to members who create/design outstanding graphics for UFS that are both unique and original. Order of El-Adrel IV - Awarded to members who help foster communications between UFS and those outside UFS, be it other groups or members of the community. 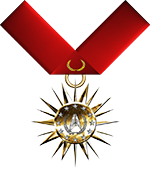 Order of El-Auria - Awarded to members who help foster communications, be it between chapters, sectors, or individual members. Order of Earth - Awarded to members who participate in programs that help spread awareness or support Space and Exploration efforts or spread awareness of these programs. Order of Ferenginar - Awarded to individuals who have given extraordinary help or care to volunteering on a consistent basis. Order of Khitomer - Awarded to individuals who have volunteered their time helping during UFS-related events. Order of Organia - Awarded to individuals who organized or participated in bringing UFS closer to the community. Order of P'Jem - Awarded to members who take part in or organize humanitarian actions. Order of Pacifica	- Awarded to individuals who take part in or spread awareness of outreach programs that work to raise the quality of life for people. Big Brothers/Sisters for children, visiting the elderly, the physically handicapped like Wounded Warrior, or those with serious diseases such as Cancer. Order of Qo'noS - Awarded to individuals who have been recognized becoming a better overall person, be it become more sociable, more mature, more charitable. Order of Remus - Awarded to individuals who have shown UFS in a positive light and had members join because of it. Order of Risa - Awarded to individuals who organized successful Fun events in name of UFS. Order of Romulus - Awarded to individuals who have been recognized as developing their professional skills either for UFS or themselves.